It's summer and we are all headed to the beach. With Anawangin always teeming with people, I made a list of alternative beach camp sites near Manila. Named after two of its more popular counterparts, Borawan got the best of both -- the white sands of Boracay and the picturesque rock formations of Palawan. This beach is perfect for the adventurous who want to go rock climbing and rapelling. Just be sure you do it with experts. There are small cottages for rent here. There is a comfort room available, which is about three minutes walk from the campsite, but be ready also to do it au naturel. Better to arrange freshwater to be delivered to you from the caretakers, for washing up. Careful also of the sea urchins. Also, just pack enough foods, then check out the fresh catch of local fisher folks. You will be surprised at how cheap you can get those fresh seafoods. The first time we went to Padre Burgos, we camped at Borawan and we were toasted to a crisp. So, the better camp site is Dampalitan Beach, with Borawan as a side trip. There are lots of trees in this area, a good comfort room and cottages for socials. There is also a small sari-sari store in case you run out of supplies. 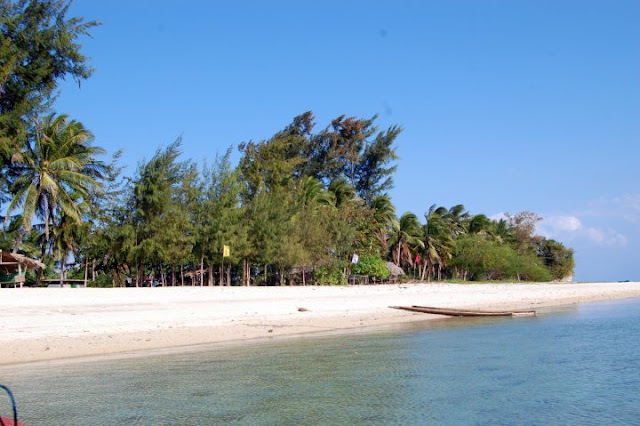 It is either you trek to this place from Pagbilao or ride a boat from Padre Burgos and make this part of a beach hopping itinerary together with Borawan and Dampalitan. I heard camping or overnight stay is already allowed in this place. Last year, because of land dispute, camping was not allowed. The sands here are really white, as in really and it stretches 70 meters long. Waters are cool, but careful again of the sea urchins. There are cottages and comfort rooms available. 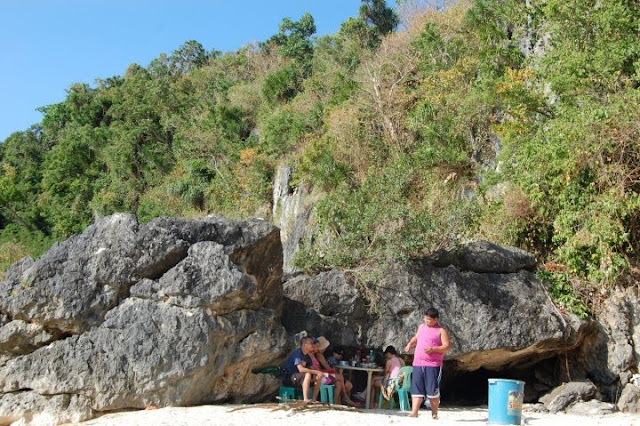 There is a small cave near the beach called Kwebang Lagpas. How to get here? From Manila, take South Superhighway. Head on to Bondoc Peninsula. Padre Burgos is the first town of Bondoc Peninsula, approximately 160 kms. from Manila, around 4 to 5 hours drive. There is a small rotonda there and on the right is a road leading to Aplaya where boats may be arranged. The boat ride is short, but it is scenic. Some more tips: We usually leave Manila at 1Am so we can be at Padre Burgos at first light. We take our breakfast at the Padre Burgos public market, while waiting for the goods to arrive. This is a small market, which I think is just enough for the small town of Padre Burgos, so don't take so long in deciding what to buy as they will easily run out. Try to bring also a mineral water container so it can be refilled here for your drinking water supply in the islands. 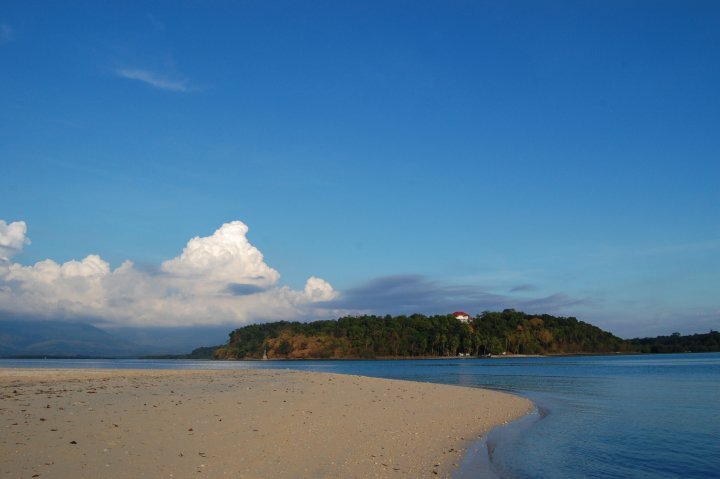 This island is listed as one of must summer destinations in the country. We usually stay at Villa Cleofas. There are cottages available and comfort rooms. They also have a small generator at night. The island is known for its white sand and this stretches far, especially during low tide when water moves really far, exposing more white sands, rocks, sea creatures and corals. During low tides, guests can walk to the island in front called Bonsai Island. From Mauban, Quezon, there are public boats available and they have two morning schedules. Then, it is a short leisurely trek to Villa Cleofas. If traveling on a big group, Villa Cleofas has a boat, which guests can rent. Meals may also be arranged with the resort owners. Of course, not us, we love cooking our food. It is part of our socials. This is Anawangin's twin sister, so a good alternative, with fewer people. So, if you miss the pine trees lining the beach of Anawangin, the verdant cove and cool, deep blue, here is Nagsasa. There are cottages and comfort rooms available here. This is like Anawangin also. You can trek here or take a boat ride from Pundaquit. It is approximately an hour more from Anawangin. Quite a long drive but very short boat ride. 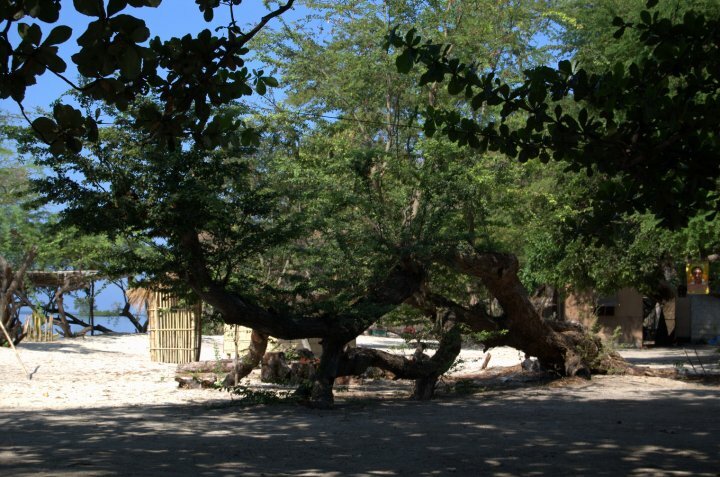 Magalawa is located in Palauig, Zambales. It also has everything -- white sand, a sand bar, pristine blue waters and some creature comforts like cottages and comfort rooms. Potable water is available in the island, but for safety, bring your own. 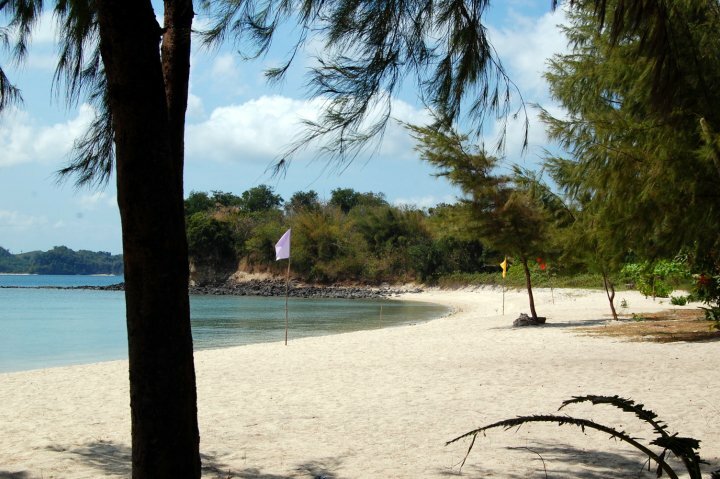 There are also sites here for snorkelling. What I like about Magalawa? Trees everywhere, so it is cool even during hot summer days. Boats are available at Oslet Compound, at I think Php 100.00 per head, round trip. From Banlog Triangle, keep right. You'll pass by Mt. Tapulao signage and Salaza Bridge. After the bridge, slow down as you need to turn left to the veritas road going to Oslet Compound. This is one of Guys4Mountains favorite getaway, well-promoted by our friend Kel. I think they hike when they first went here, but you can take your vehicle near the beach. Just a small descent from the parking lot to get to this cove. It is also a white sand beach. What I like about this beach? The water is so cool and gentle, it is like swimming in fresh water. Cottages and comfort rooms are available here. Oh Calaguas! I think I shall never find a sand as pink as thee (until I get to Sta. Cruz Island). How I love your azure waters and creamy white sand beach that looks pink to me. The sands are so fine. There is a deep well where guests can wash up and tables for socials. Everything else, including water, you have bring from the mainland. Thing about Calaguas, it is quite far, about 8 hours drive and 3 hours boat ride, but hey, nobody said going to paradise is easy. Of course, Aurora will not be missed in this listing. The difficulty here is choosing. Since Digisit is special (TREK's camp site, also where I celebrated my birthday 2 years ago), it is included in this list. Coconut trees line the beach, so careful in pitching those expensive tents. 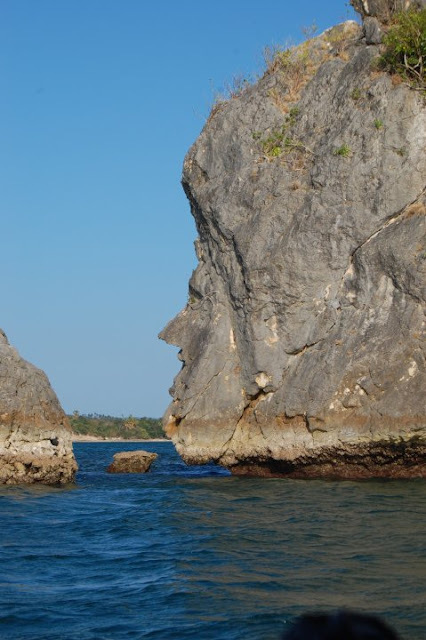 The rock formations in the beach are just so magnificent. Best about this beach, potable water is available so there's no difficulty in cooking and mixing chasers. Like Calaguas, this is far, but less than 8 hours drive. This is near Baler and there are nearby sites to explore like the waterfalls, Ermita Hills and Pag-asa station. We discovered this also because of TREK. We arrived in Dilasag, Aurora night time so we were not able to appreciate the beach. Actually, with a bucket filled with lobster got a terribly low price, it is really hard to focus on anything else. The next day, we went on a short trek in a grass covered, gently sloping Parang hill to get to this super awesome beach, filled with rock formations, some forming small pools of water. With the roads fixed, Dilasag is only about four to five hours drive from Baler. Still, this is something reserved for a long weekend. Visitors may also include in Casiguran in the itinerary, which is as beautiful as Dilasag. Nice list of beaches nea Manila. Now I know where to got through pag may balak akong mag outing with family and friends. this is amazing, your list sure comes in handy! Take a boat down the river and enjoy a whole new part of theSOLAS propellers SOLAS propellers for sale. Buy your SOLAS prop today and save. Largest inventory of SOLAS aluminum and stainless props available. Holly enjoying is nice. I hope if I were there in with all gays then feeling excellent. SOLAS propellers SOLAS propellers for sale. Buy your SOLAS prop today and save. Largest inventory of SOLAS aluminum and stainless props available. Thanks! Looking forward to exploring that part of Palawan.